Neurobiological experiments are becoming more complex. Many require multiple manipulators with control units that quickly become space and/or cost prohibitive. The MPC-200 is the solution you have been asking for. A single controller capable of running 2 manipulators! 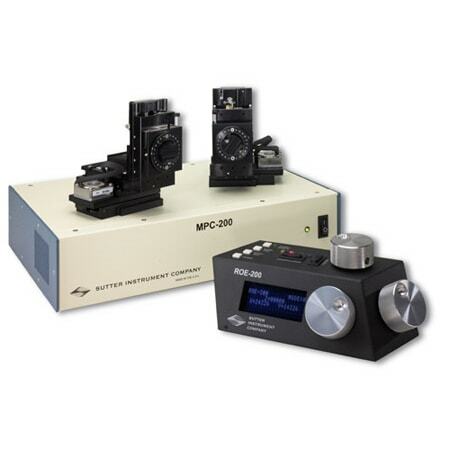 Sutter Instrument has taken the simplicity of the MP-225 controller and expanded it to run two manipulators from a single controller/ROE. The MPC-200 works with one or two of our world-renowned mechanicals, the MP-285 or the MP-225. To provide the ultimate in flexibility, the MPC-200 can be purchased separately or in one of several basic systems. Additional component pieces can be added at any time, allowing the user to develop a system tailored to his or her particular needs. The controller is self-detecting so there is no need for manual configuration of the components. Minimal microstep size is 62.5 nanometers per microstep. Display has single micron resolution. Full travel is 25mm in each axis.